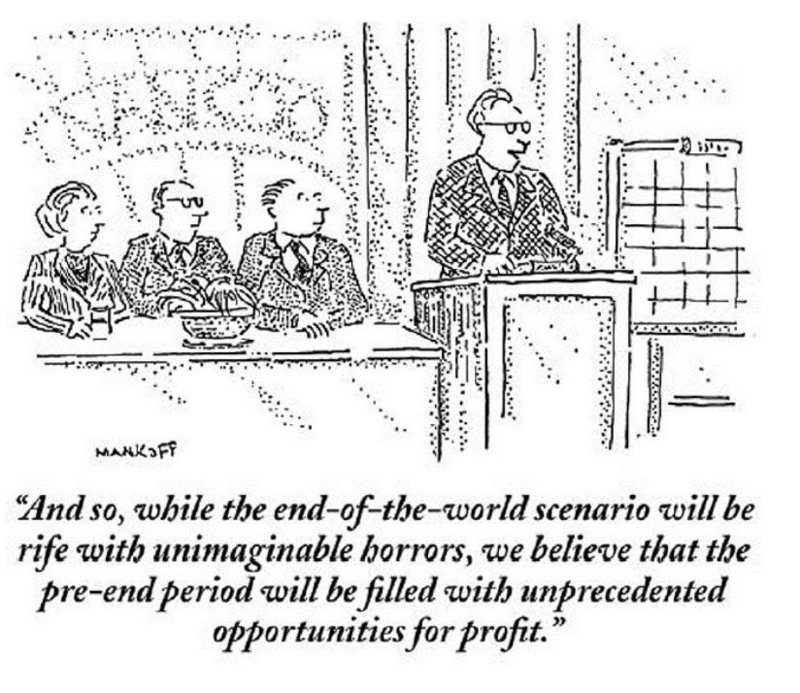 The following cartoon, recently published by Horizon Kinetics, echoes this past episode and reminds us that contexts may change, but human nature does not. 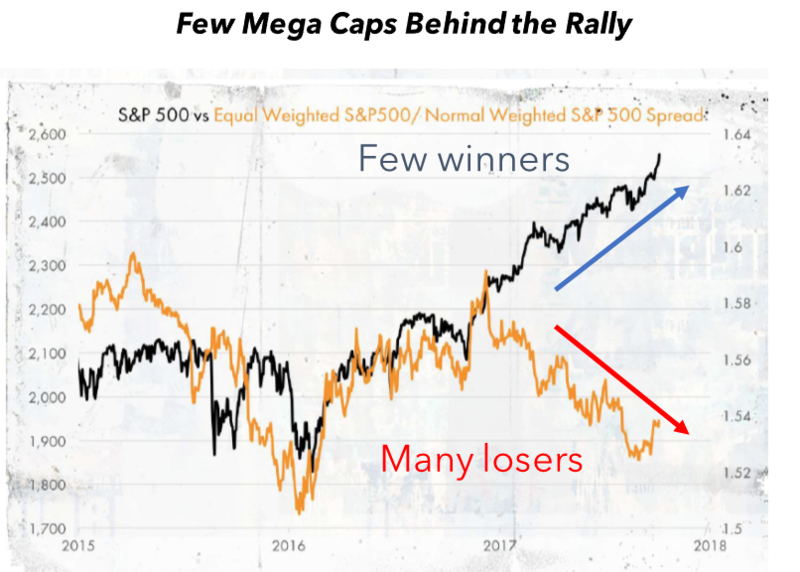 The general perception, including ours, has been that much of the strong performance of the US stock market in the last ten years, as well as its current statistical overvaluation, can be traced to the increased weight in the major indices of the so-called FANG or FAANG (Facebook, Amazon, Apple, Netflix, Google) and a handful of others. However, while stressing the worrisome popularity of the FANGs, with dedicated FANG indices and futures now available to so-called “passive” investors and momentum traders, investment manager GMO recently argued that the FANGs are not overvalued relative to the market but that it is the entire US market that is overvalued. 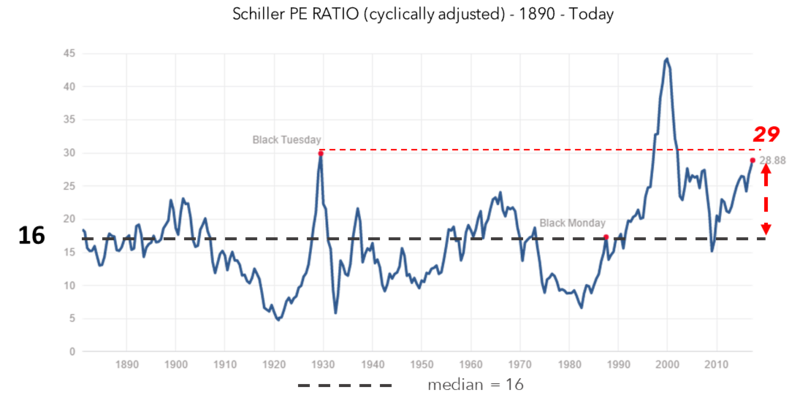 High valuations may increase the markets’ vulnerability in a downturn or even be the harbingers of lower returns in the longer run, but they do not necessarily equate with the irrational exuberance of a bubble. In fact, The Collaborative Fund’s Morgan Housel argues that people who bought Florida property during the 2004-2006 housing bubble, for example, should not necessarily be viewed as irrational. 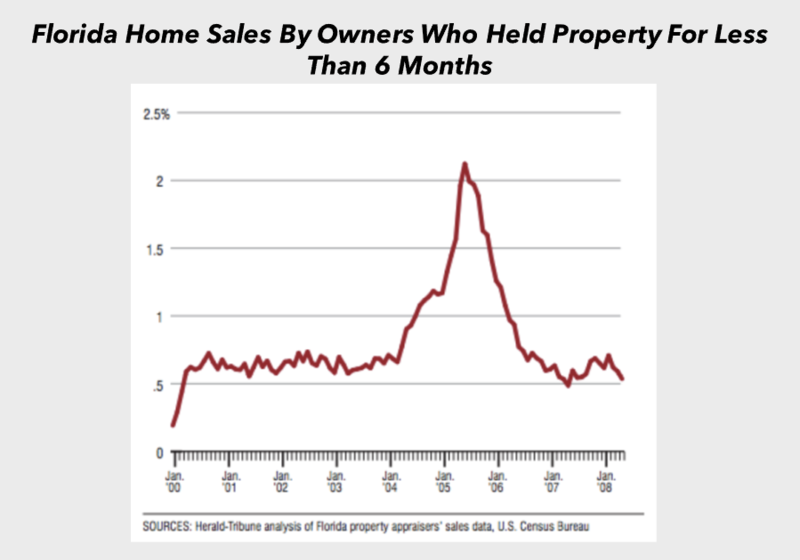 The high prices did make little sense for traditional home buyers, who typically measure a property’s price against its potential to generate income if rented for a number of years; But, if buyers were purchasing with the intention to “flip” the property within six months, as the graph below implies, then long-term valuation criteria were becoming irrelevant to a growing number of housing market participants. 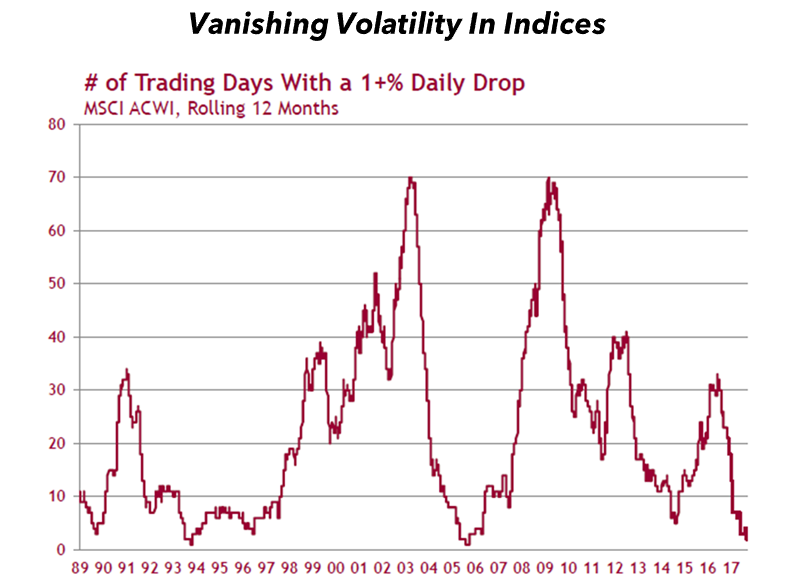 In the same way, today’s equity investors may be focusing less than historically on valuations because they also have no intention to hold on to their position for much longer than a few months (See the cartoon at the top of the article). 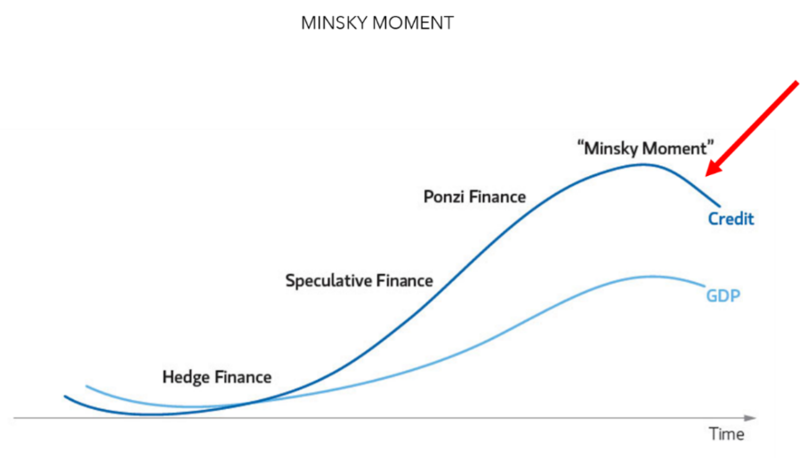 In Housel’s view, bubbles develop when investment horizons shrink, and more and more long-term, fundamental investors capitulate to join the recently successful short-term momentum game. In doing so, they lose sight of the risks that will come when the stock market reverses. Yet, “flipping” can prove an expensive gamble, as buyers of apartments in “Billionaires ‘Row”, across the street from our office, are now learning with several units being sold or foreclosed at 30%-plus discounts from their $30-$50 million purchase prices a few months ago. 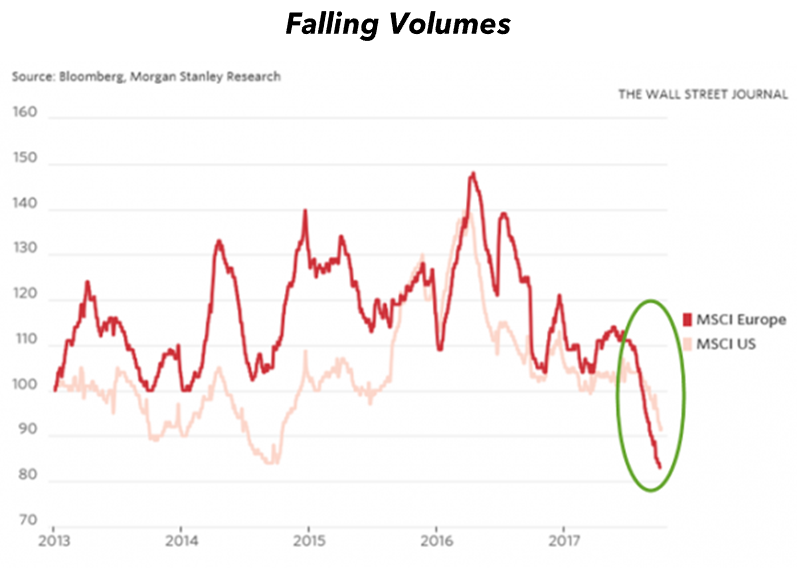 With peak valuations, and investment horizons shrinking, investors and speculators alike are increasingly desperate for returns and yield. 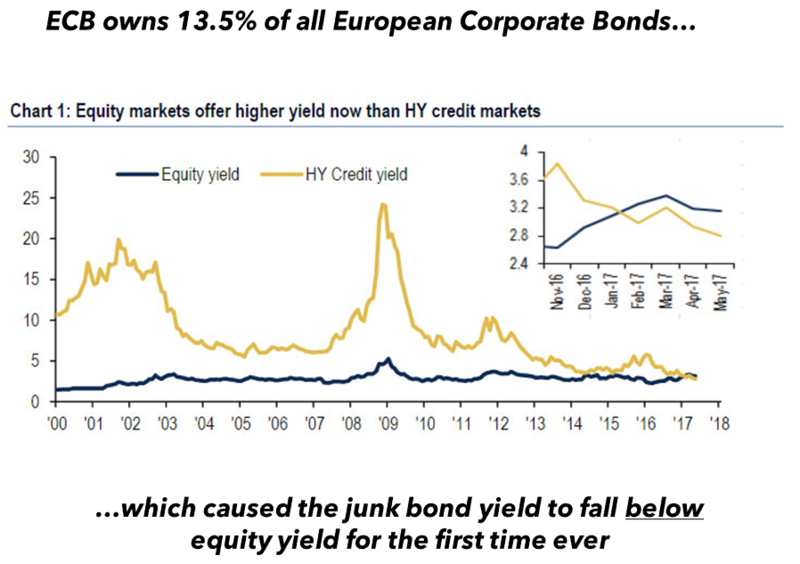 Growing interest in emerging markets and ever-falling emerging markets junk bond yields are premier example of this phenomenon. Source: Bloomberg, Real Vision (left), J.P. Morgan (right). But desperation and the feeling of having no alternative are no recipe for successful investment in anything. In spite of peak valuations, shorter investment horizons, and proliferation of risk taking, it is hard to characterize the recent bull market as euphoria-driven. Instead, it has been slow and sustained, with many investors having had no experience of a serious down market or choosing to forget previous crises. This mindset has translated into highly passive and complacent investment approaches. With no down years or months, the most successful choice, so far, has been to remain fully invested. Source: ICI, BofA, Rydex, Federal Reserve, Sentimentrade.  The current low (perceived) volatility, low volume and passive, complacent markets awaken memories of Dr. Hyman Minsky, for whom financial and economic crises did not need an outside trigger, but were a natural stage of the free-market cycle. 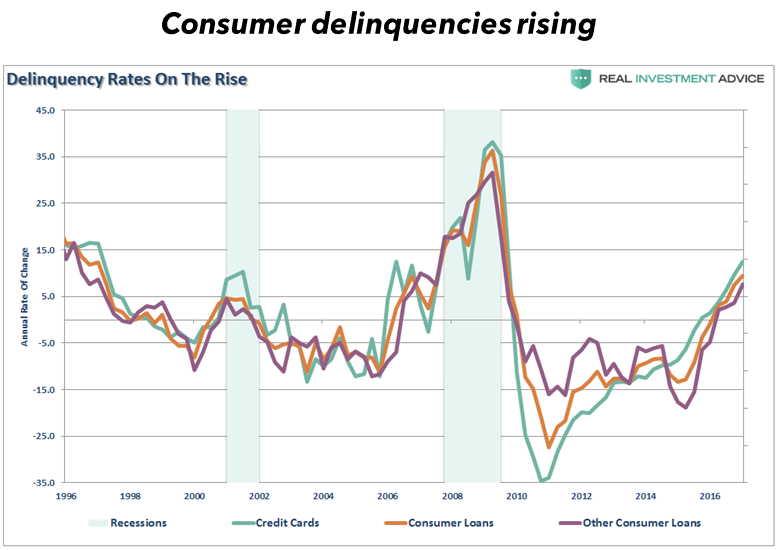 According to Dr. Minsky, a period of sustained economic and financial stability encourages risk taking – especially through the growing use of debt – until excess leverage causes a sudden collapse in asset prices, which is a normal part of the credit cycle. Long periods of stability thus naturally lead to instability, though with elusive timing. If, according to Minsky, financial crises and recessions do not require an external trigger, why do they develop? A useful way of understanding the apparent randomness of market crashes is the Abelian sand pile model. The computer model of a sand pile is developed by virtually dropping individual grains from above: it continues to grow, apparently smoothly, until a critical state is reached from which a single grain can cause a collapse of the whole structure. According to physicist Mark Buchanan, the critical state of the sand pile is characterized by ‘fingers of instability’ that develop through it under the surface. We don’t know how to predict which grain will be the one that triggers that avalanche. Similarly, when signs of vulnerability build in the economy or the financial market, it is hard to predict if, or when, their accumulation will trigger a simple correction or a major crisis. Where would we look today for such fingers of instability? Most likely in areas where published statistics are contradicted by discrepancies below the surface. With the majority of money managers struggling to keep up with official market benchmarks, more investors have been adopting passive (index-linked) strategies rather than active ones (stock picking). Since major stock indexes are capitalization-weighted, the higher the stock market capitalization, the greater a company’s weight in the index. This is why, in recent years, the overall market performance has been increasingly influenced by relatively few “mega caps” such as the so-called FAANG (Facebook, Amazon, Apple, Netflix, Google). As a result, trading volumes in the rest of the market have collapsed and volatility seems to have evaporated. 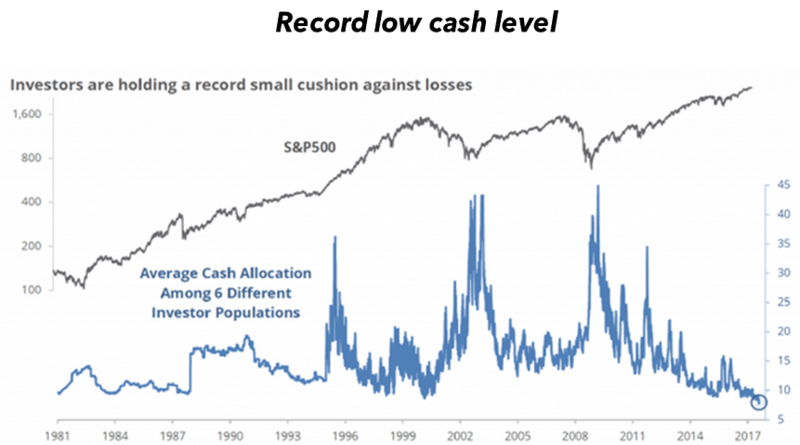 Under the surface of peaceful and calm markets, however, many smaller companies, even in the same industries, tend to trade in a wide range with violent rallies and sell-offs. 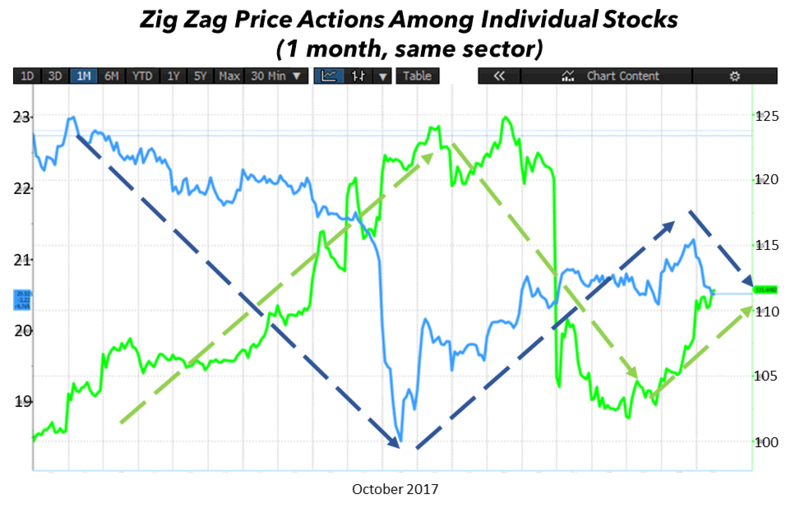 The chart below depicts a one-month price action of two of our holdings from the same industry that proved to be surprisingly volatile and erratic despite the calm we see on the surface of the equity markets. During a prolonged period of stability, historically, an early indication that a bull market is aging has been when a group of stocks eventually dominates trading volumes, index performances, and the news, while the broader market begins to lag. We saw the Nifty Fifty stocks in the 1970s, the internet bubble stocks in the late 1990s, and today’s we are watching the FAANGs take the spotlight – Facebook, Amazon, Apple, Netflix, Google. The discrepancy between the volumes of trading in mega-cap stocks and the rest of the markets under passive, index-shaped investing has created a divergence in price performance as well, between the few large-cap winners and the many losers in the current stock market. Source: Steve Bregman, Horizon Kinetics, Real Vision. Source: Real Vision, Hexavest, Datastream. 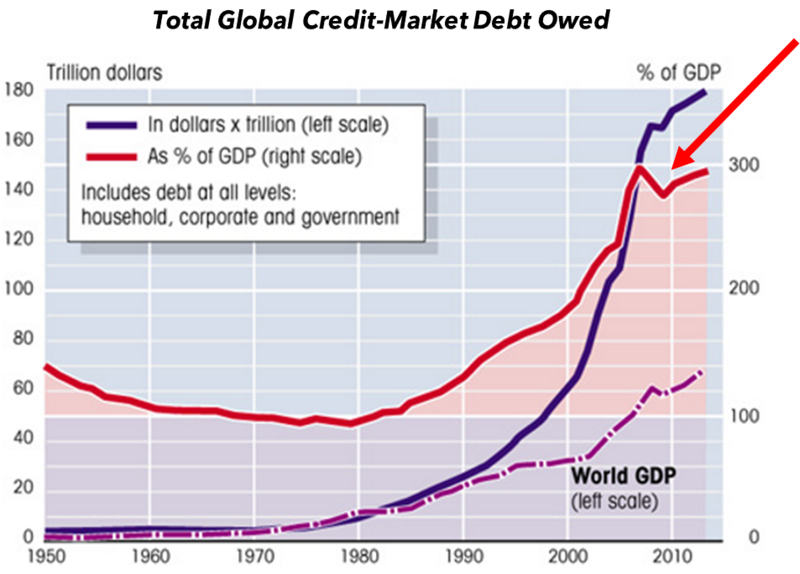 Despite recent releases of continued strength in the United States and accelerating economic growth in Europe and maybe even China, it seems that much of that growth is being “borrowed”. 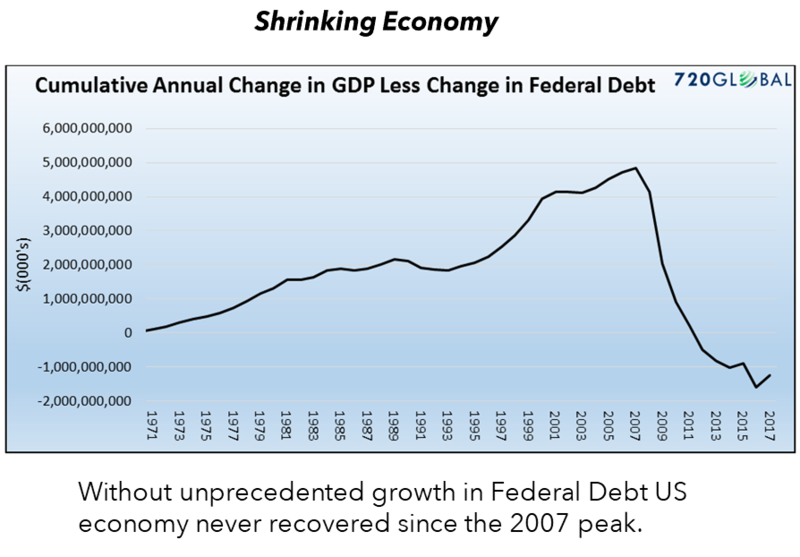 For example, if we account for the share of the Federal Debt in US GDP growth, we’ll see that the economy net of borrowing has actually been shrinking since the Great Recession. 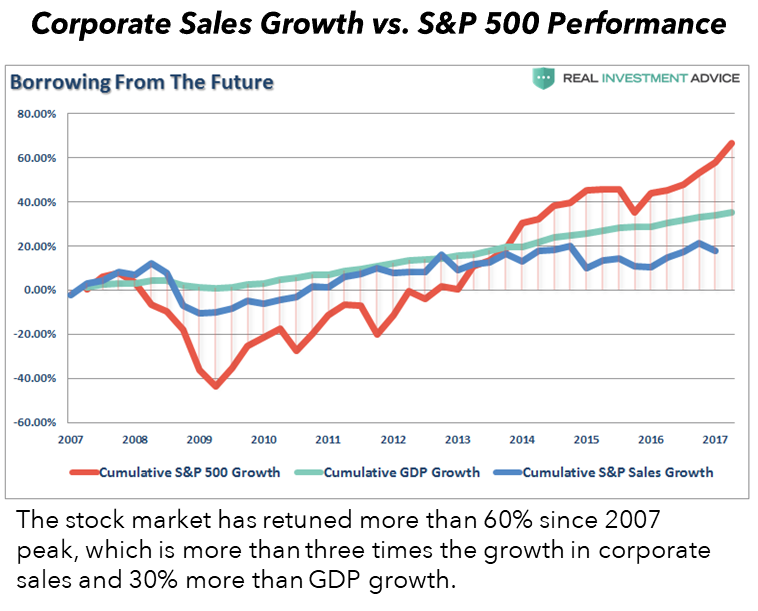 Furthermore, in spite of its use by some politicians as a measure of the economy’s well-being, it should be remembered that the stock market has greatly outpaced both GDP growth and corporate sales growth. 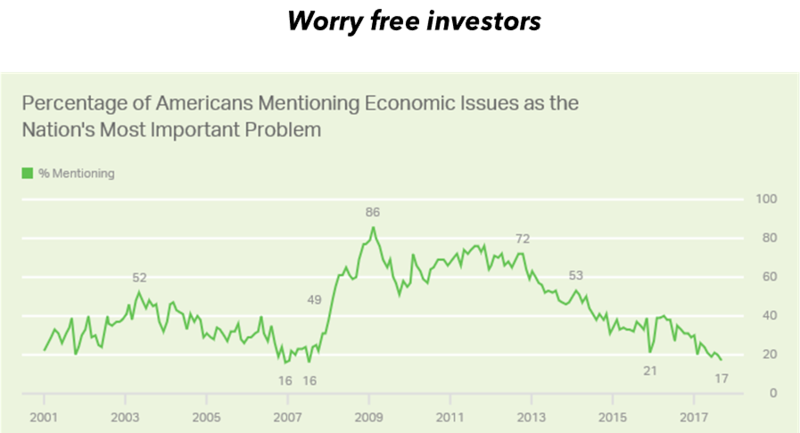 Thus, the real economy may be less robust than indicated by Wall Street. Not only governments, and corporations have borrowed more in the last decade, but also consumer. 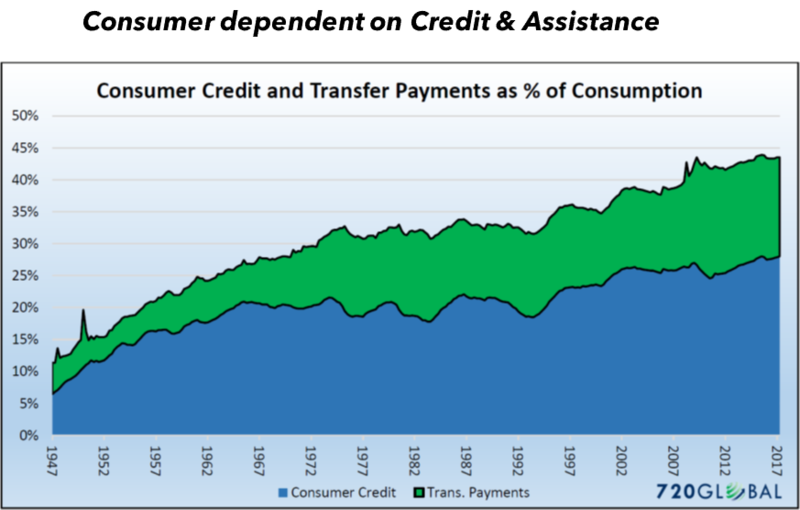 It is increasingly worrisome how a fragile consumer depends on credit & assistance. 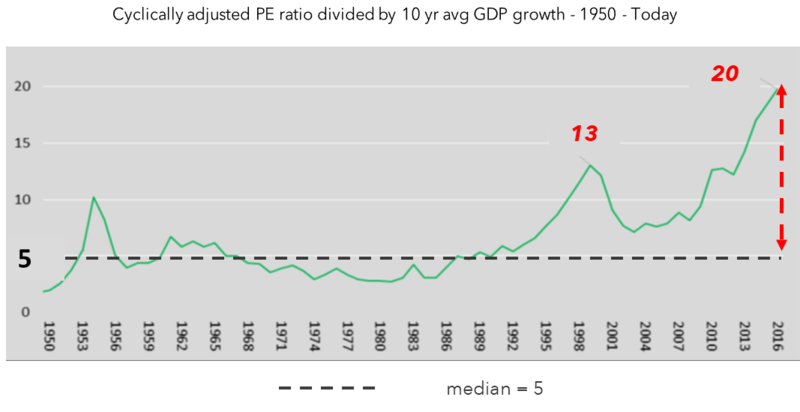 There may be some argument about the conclusiveness of the chart above, but there should be none about the following one: delinquencies are on the rise, especially in the last couple of years. We live beyond our means, and for a while now, we’ve tried to maintain the same lifestyle with the help of increased debt, and public assistance. 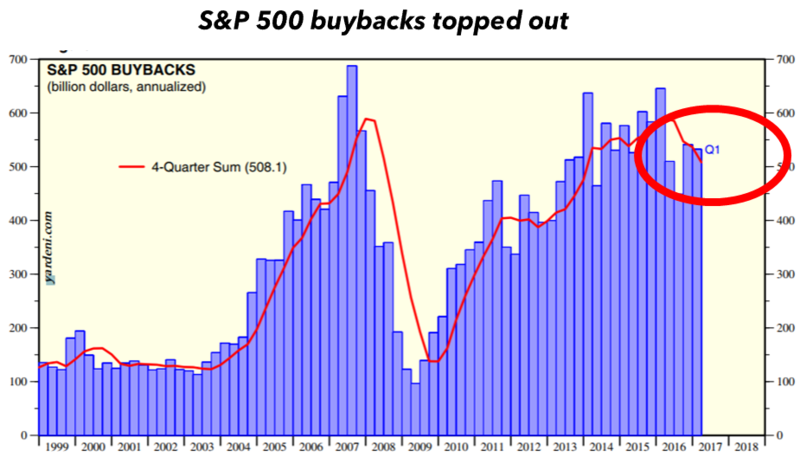 Not only do investors remain complacent, but corporation themselves helped prolong the rally with buybacks of their own shares, partly funded by massive borrowings. Source: Standard & Poor’s Corporation. But, even as corporations’ support of stock prices seemed to abate, Central Banks took the relay, by accelerating a buying spree – not only of government bonds, as traditionally, but now also of corporate bonds and equities. Source: BofA Merrill Lynch Global Research. 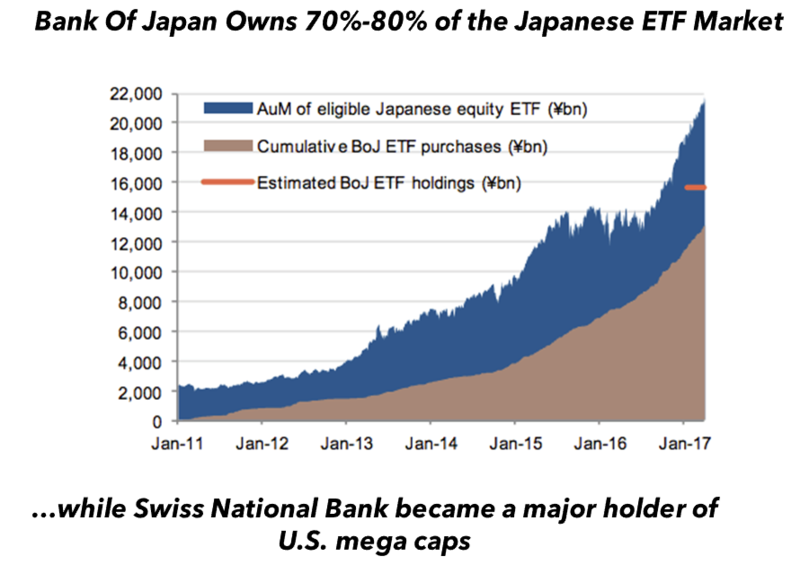 Source: SG Cross Asset Research/ETF, Bank of Japan, Bloomberg. 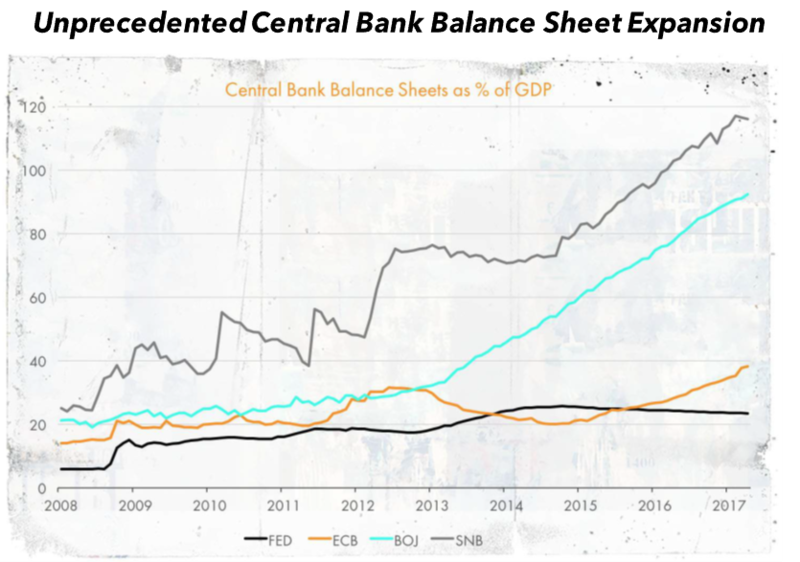 In summary, we have undergone an unprecedented expansion of central bank balance sheets, which has stabilized most economies and propelled many markets to new highs. It would be naïve to believe that a reversal of those policies can leave investors, businesses and consumer unscathed. Given peak market levels, fragile stability, and borrowed growth, the policy makers are facing a major challenge. Their policies of further easy money, and more fiscal stimulus may do more harm than good, especially in the today’s world of dual economy. Part of the economy is growing fast, and requires little assets and labor, while the other part, more traditional, seems to be falling behind, because has excess capacity, and it is s asset heavy, and labor intensive. There is also a mismatch in the supply and demand for labor. The growing economy needs more employees than it can find, while the traditional economy has fewer job openings that those willing to them. To save the latter, we may be overheating the first. And anyone who still believes there is no inflation, we recommend taking a look at exponential growth in bitcoin price, new, breath taking record in art price sales, and record asset prices all around. Being optimists at heart, we believe that those high-risk markets are usually if not always followed by some of the best buying opportunity of a generation. We trust that we are prepared for it, and we are looking forward to it. This article is not intended to be a client‐specific suitability analysis or recommendation, an offer to participate in any investment, or a recommendation to buy, hold or sell securities. Do not use this report as the sole basis for investment decisions. Do not select an asset class or investment product based on performance alone. Consider all relevant information, including your existing portfolio, investment objectives, risk tolerance, liquidity needs and investment time horizon. This report is for general informational purposes only and is not intended to predict or guarantee the future performance of any individual security, market sector or the markets generally.